I have made a discovery. It is peanut flour. Maybe you already know about this richly flavored, silky smooth, gluten-free, low-fat, protein packed ingredient? I just found it recently. Actually, the Peanut Board in Georgia sent me some to play with and I went gaga over it. Then, I was perusing the aisles at Trader Joe’s, as I am apt to do, and there it was in their minuscule baking section. Which means I am NOT the first to know about this. Unlike other nut flours this one is defatted, which means they remove a portion of the fat, so the peanuts can be milled to a powder. The result is an amazingly smooth texture, with lots of healthy protein and very little fat. These peanut butter cookies seemed an obvious recipe to start playing with the flour. I wasn’t expecting the flavor to be enhanced as much as I was looking for a gluten-free alternative to the classic cookie. Boy was I wrong, the flavor was more intense and the texture is smoother and more tender than my old recipe. I’d never thought to do a peanut butter cookie post before, because honestly it just didn’t excite me enough. Now I can say I am all atwitter about these cookies! The trick to their success is slightly under baking them so the center is a bit soft and the outside is crisp. I also used a chunky peanut butter for even more peanut taste and texture. See my pastry movie recommendation at the bottom of this post. 2 cups (7-ounces) peanut flour (I tried the light and dark with great results, but prefer the roasted peanut flavor of the dark) Trader Joe’s version also works well. Preheat the oven 375° with rack in the center of the oven. Cream together the butter and brown sugar in a mixing bowl with the paddle attachment about 2 minutes on medium speed. If you are not using a Beater Blade then scrape the sides of the bowl often. Add the peanut butter and mix well. Add the eggs one at a time, mixing until well incorporated. Add the vanilla. Use a 2 to 3 tablespoon Scoop to form the balls of dough. Or use a spoon and then roll them into balls. Use a fork to flatten them and create a crosshatch pattern. Sprinkle with sugar and bake for 8 to 10 minutes. They will puff up slightly and the tops will be golden, but they should still be slightly soft in the middle. 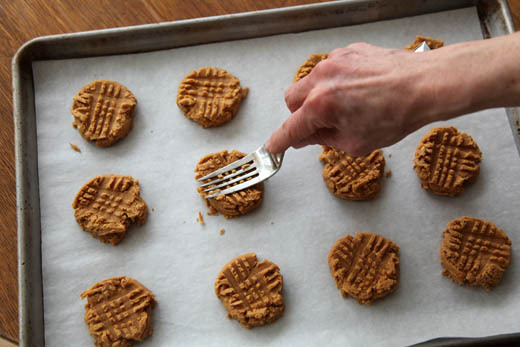 Of course, if you like your peanut butter cookies crunchy throughout then bake another couple of minutes. I have a movie recommendation for anyone interested in the intense world of first class professional pastry chefs in France. It is called the Kings of Pastry and features chef Jacquy Pfeiffer, co-founder of Chicago’s French Pastry School. It is an honest view of his preparation and participation in the MOF competition. Be warned it is anxiety producing, but incredibly touching. that’s it! i’m finally going to buy some peanut four. heard so many great things about it. love love love pb cookies! I’ll be looking for peanut flour the next time I’m out…excited to try this recipe. I’m also adding the movie to my list of ones to watch. yes, i’ve seen the peanut flour at TJs and was trying to think of an excuse to buy it. thanks for the recipe (it’s gluten free, too, i guess)–next time i’m there, it’s going in my cart! Now, I have to try peanut flour! 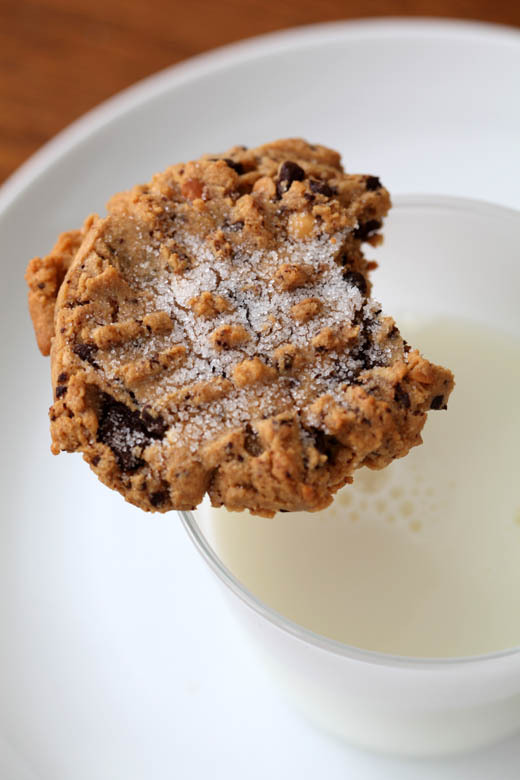 Sounds great in these cookies, and so do the chocolate chunks. I have the TJ’s peanut flour & can’t wait to try this recipe. Thanks for sharing. Very nice recipe! First time I’ve seen the peanut flour myself. I’ve done quite a bit of gluten free baking and we usually add a small amount of xanthum gum to simulate the chewiness of a gluten structure. Did you notice any difference without it? I use xanthan gum when baking g-f breads, but didn’t seem to need it with these cookies. The peanut butter and eggs seem to provide the protein structure they need. And ugh, I meant Xanthan gum. Sheesh can’t spell today. darn, just was at TJ…. these look scrumptious. PB cookies are one of my fave. I soooo love pb cookies! But I never knew about on flour! Tx u! I haven’t tried baking with peanut flour before. I imagine it must be perfect in these cookies though. They look delicious! I really enjoy reading your blog, but printing out your recipes is a nightmare! I went to print this recipe and it was 8 PAGES!!!!!! 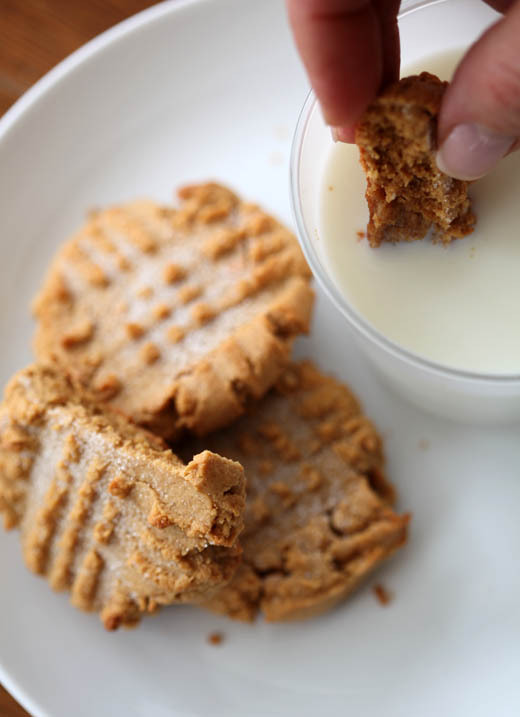 Do I really need a full page picture of 2 stacks of pb cookies, or another of your fingers dunking a piece of cookie into a glass of milk?!? Never again! The only way I know to do this is to copy it into word and delete all the photos before printing. Hope that helps! I have to say I had never heard of this flour before. I am a chocolate and peanut butter lover. So, here goes…Today I am using this flour to try a peanut butter pie crust in a chocolate pie. I will let you know how it comes out. I LOVE the pictures. When I purchase a cookbook, it is a must for me to have beautiful pictures as part of the book. Its great to experience the whole thing. Thanks Zoe!! The cookies look wonderful–I’ll have to try and find the peanut flour! I wanted to say thank you also for the heads up on the “Kings of Pastry” movie. Just watched it (streaming) on Netflix and enjoyed it SO much! PS……I love the pictures too! Thanks for all your generosity and hard work! This sounds so yummy! I’ve never heard of peanut flour before but we just got a Trader Joe’s nearby so maybe I’ll have to try it! i just bought the Kings of Pastry ! and have not watched it yet :0 ..and i just baked coconut cookies with coconut flour..on to peanut flour! I immediately watched the movie on Netflix after visiting you mention it on your FB, I really love it. Thank you. Beautiful cookie, peanut flour is really new to me. Sounds superb! Isn’t the movie incredible; both inspiring and intimidating! I’ve just heard about peanut flour, but have yet to pick some up at Trader Joe’s. I want to try to make pancakes with it! Zoe, the people at Trader Joe’s in St. Louis Park say they don’t have peanut flour. Knowing how they frequently discontinue items, I’m worried that this product has been discontinued now that I’m dying to try these cookies. (They seem to have a knack for discontinuing some of my favorite products; the latest is their Australian Parmesan.) Is there a particular Trader Joe’s in the Minneapolis area where you’ve seen peanut flour? Thanks! I got it at the same one you checked! ;( Sorry to hear they aren’t carrying it anymore. Maybe it is worth a request to the manager. In the meantime you can order on line if the craving persists! I actually prefer it to the TJ brand! Costco in Eden prairie has it. 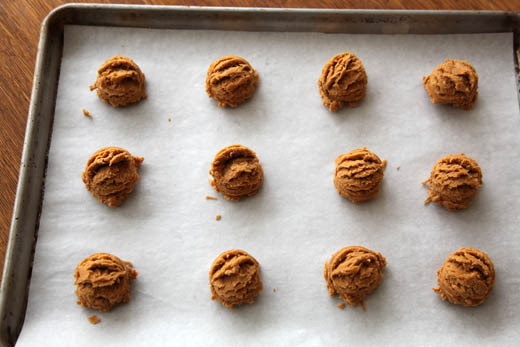 Peanut butter flour and powder are one and the same. Love it! Zoe – just made these cookie (with a few additions). I had to order the flour from Southern Grace Farms b/c TJs doesn’t carry it anymore. And SGF assures us that it is GF. When I opened the bag, I wanted to eat the flour with a spoon – the smell was that amazing! Thanks for recipe – they are cooling and I cannot wait to try one (although the dough taste test was swoon-worthy…). Thank you!!!! So glad you tried the peanut flour, isn’t it amazing! Thanks for trying the cookies too! Hi Zoe! southerngracefarms.com, netrition.com, and iherb.com sell the exact same peanut flour that trader joe’s carried. They sell Protein Plus, which was the company that made Trader Joe’s and private labeled it for them. I have been using it for several years now. Bought it in bulk online and gave a bunch to my son who is diabetic. I make him chocolate chip cookies using the toll house recipe and switching out peanut flour for reg., spenda and diabetic brown sugar for the sugars, and sugar free chocolate chips for reg. I am thinking the peanut butter ones would work as well. You were lucky to know about this flour way back, I adore it. Your cookies sound fantastic! A friend of mine uses it for fried chicken too, something I have been meaning to do. Trader Joe’s discontinued the peanut flour, but the company that private labeled it for them was Protein Plus. You can find their flour at several different websites and they have some yummy recipes on their website! I want to make these. I started measuring 2 cups but it isn’t nearly close to 7 ounces. I bought the flour from the company you recommended. Before I went forward with baking them i wanted to make sure the 7 ounces wasn’t a typo or maybe the 2 cups was. Could you please help me ASAP. How many ounces are you getting per cup? How are you measuring the flour? Hi Zoe. I just saw your response. I actually just made them tonight but I used 7 ounces. When I measured 2 cups it equaled 5 7/8 ounces. I used a scale. They taste great but I am not wondering if maybe i should have just used 2 cups….they are a little heavy. But maybe that is how they are supposed to me. Could you email me back. Sorry! They are a pretty dense cookie, but if you found them to be too much so, then give it a try with the smaller amount of peanut flour and see if that suits you better. I hope you will report back and let me know. I am pretty sure that 3.5 ounces per cup is correct, but I will double check when I get more peanut flour in the house. 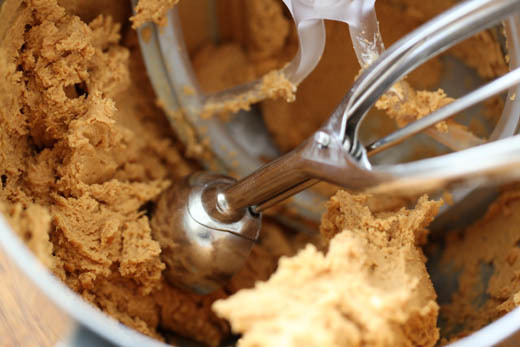 Try sifting the peanut flour before adding it to the dough. I did that. I used a food processor instead of a stand-up mixer and made a few modifications. The texture is wonderful. Hi Zoe, I tried these and modified them into Peanut Blossoms. I halved the recipe, using everything listed, but substituted Imperial margarine for butter, since my gluten-sensitive friend is unable to have dairy. I used Reduced Fat Super-Chunk Skippy for the peanut butter. I mixed everything in the food processor and checked the dough when it became a ball. I added 1/4 cup granulated sugar and 1/4 cup oat flour, then reprocessed dough. I rolled each walnut-sized ball in some granulated sugar, baked them, then presses a Hershey’s Special Dark Chocolate Kiss into each. Just tested them. 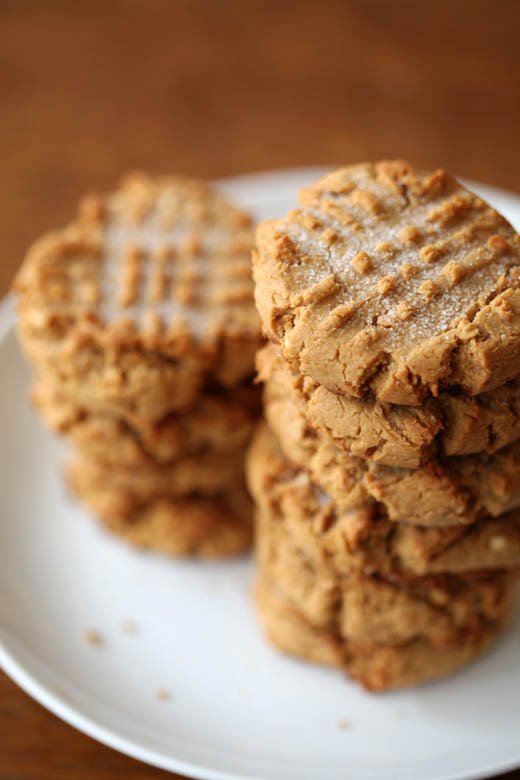 They are really good and texture is what it should be for a Peanut Blossom cookie. Thanks for the recipe! Made these with a few modifications to suit what was in my kitchen: I used regular margarine and table sat. Added pb chips and did not flatten. I work in a truck manufacturing company with all men, and these were gone before I could get one. I have already been asked to make more! Just finished making these. One-half with mini chocolate chips and 1/2 with a Hershey’s kiss (thumbprint). PERFECTION! I followed recipe exactly. Thank you so much! I wish I could upload a photo to show you how perfect they are. Taste great and look marvelous! Yay, I need to make them again, it has been too long and I love them. These would be low carb, if not for the brown sugar. Have you tried these with Stevia or other non-sugar sweetener? I’m desperate to find a low carb that includes the peanut flour, rather than just peanut butter, stevia and eggs! I haven’t used stevia, but I bet they would work with it. I’ve just not sure what the conversion will be? 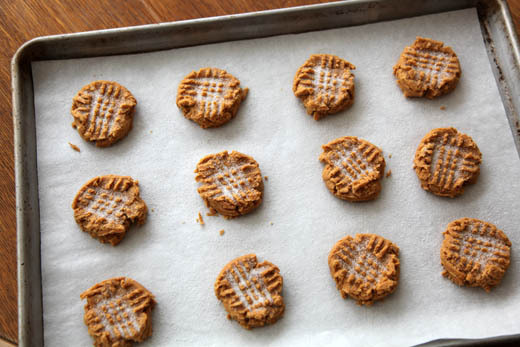 Hi – I’d like to make your Ultra Peanut Butter Cookies, but am quite confused by the recipe. First, where peanut flour is listed it’s crossed out and second, the amount is listed as 2 cups (7 oz.). I thought there was 6 oz. in a cup. Can you give me some clarification? Thanks so much. You also commented about light or dark. Were you talking about peanut flour? I’ve only ever seen one kind. The reason it was crossed out is because it used to be an amazon link and they discontinued the product. Every ingredient weighs a different amount, which is why weights are always more exact than cup measures. Peanut flour is quite light, so it weighs less than some other flours.